What a great mix of yummy treats baked right here in our own back yard! 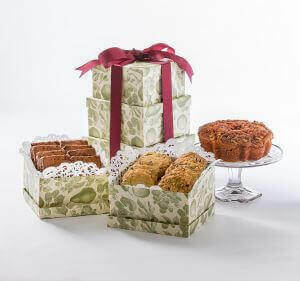 Distinctively delightful and the perfect size for snacking, this gift box tower contains a 1.5 lb. cinnamon walnut coffee cake, six chocolate chip cookies, six cow girl cookies (cranberry, sesame and pumpkin) and six chewy brownies. All packaged in a beautiful tower.